Little children like to crawl about, play in the dirt, wrestle on the floor with pets and more. While some kids love bath time, others are not too happy about having to get into tub or under the shower. It can be a real struggle to make a young child agree to a bath every night. But don’t worry about it. Help is at hand! To make bath time fun for kids, pre-schoolers and toddlers there are a variety of fun kids shower heads that makes bath time less stressful for both children and parents. Want to give it a try? 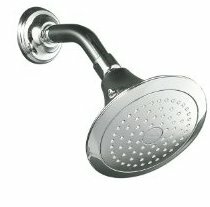 Take a look at the best kids shower heads reviews and take the stress out of bath time. Even if your kids already love their shower, you can make it happier with these kids shower heads reviews. Kids Shower Heads – Really? Sized right for the youngest members of your family, kids shower heads are fun to use. Hot water doesn’t pour down from a height, creating fear in your little one’s heart. Kids shower head systems incorporate many fun elements like the suction cup which can be attached by the side of your bathtub so that children can play with the water spray. Kids shower heads come shaped as cartoon characters, animals, flowers and children favorites that can be stuck to the wall of the shower or the side of the tub. They offer a gentle spray which kids love to play with. Shower heads for kids help them overcome any fear of water or getting wet. Adult shower heads with their high pressure flow aren’t always the nicest thing for a young person to experience. Children love a gentle to moderate spray that doesn’t sting their soft skin. Some kids hate getting their head and hair wet. They object strongly when parents try to wash their hair. A gentle spray handheld kids shower head makes this task easier. As they get used to the bath over time, children will naturally grow into normal shower heads. 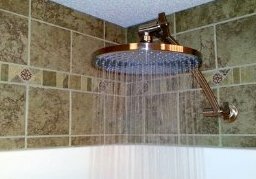 It is easy to install kids shower heads as they use existing pipe lines and can screw on to them comfortably. No expensive plumbing work is necessary. Most kids shower heads come with a diverter switch. Just flip it to use the regular adult shower head, and then you can flip it back for the kids. For more information about installation, be sure to check out the kids shower heads reviews below. The Rinse Ace 3801 My Own Shower is not only easy to install but also offers a range of fun features for your children. This kids shower head is shaped like a blowfish. It works with your existing shower head pipeline. It’s easy to adjust the height of the children’s shower head to your toddler’s height. The settings allow only a soft and gentle spray. These kids shower heads are equipped with a 3 foot detachable hose which is easily removed when not in use and can be quicky reconnected whenever needed. There’s a one year warranty. The installation guide and video on the official website help explain how it works exactly. This super cute kids shower head for babies and toddlers comes in a range of animal characters like a duck, frog, dolphin, hippo or rhino. Kids are delighted by the fun characters. The Rubber Duckie and Friends shower head offers a gentle spray that conserves water, using just about 1.5 gallons per minute. There is a diverter switch that allows switching to a big shower. Rubber suction cups allow the kids shower heads to be moved around too. You can adjust the head to differing heights of the children in the family. Mickey Mouse Shower head for kids is another popular brand that even adults enjoy thanks to the 15 different spray settings and combinations allowed. The Oxygenics pressure boosting technology guarantees that you get a good quality spray. Kids may not like powerful jets of water, so you can use the comfort control level to reduce the pressure of the water spray. The non-slip rubber handle is easy to manipulate even by toddlers. They will love the whole experience of showering and never again complain about it. This is a fun kids shower head that introduces children to their enjoyable first shower. The Sesame Street Elmo Shower Spray for Children can be hooked to the side of the water tub using the suction cups. Water is pumped from the tub into the tube and comes out through Elmo. It’s a totally fun way to show young children that water is safe. It’s not really a shower head in the normal sense, and you can not shower with it. In fact many reviewers on Amazon who have bought it are not happy since a toddler can not pump out water on their own. This defeats the purpose of the shower head. Since it’s not likely that you’ll let small children into the shower or tub alone, an adult can operate the pump while kids enjoy a fun shower. You can learn more about this model of kids shower head in the review here.